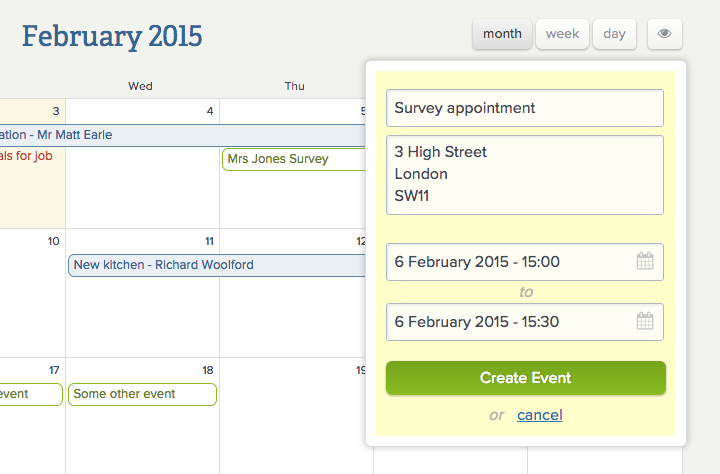 Want to keep track of your customer surveys, appointments or important events? Your YourTradebase calendar now allows you to set appointments and events for specific times of the day, so you can more easily keep track of your days. You can also choose to subscribe to just your appointments in Apple Calendar, Google Calendar or Outlook. You’ll find more details on subscribing to your calendar here. 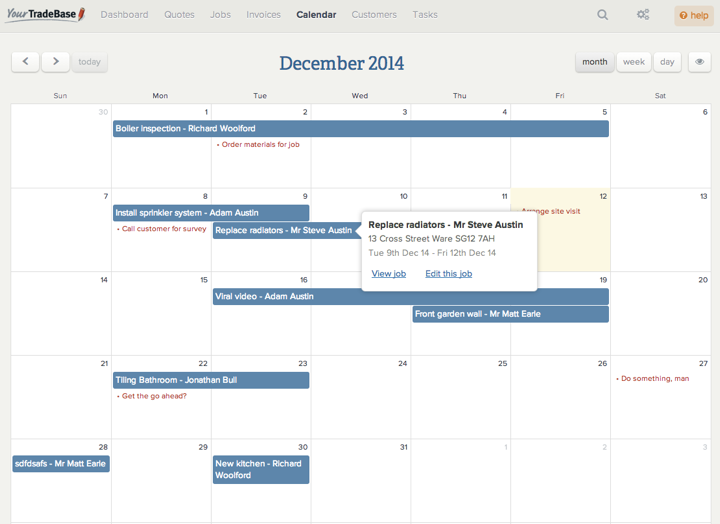 We’re welcoming in 2015 with a host of new features and improvements for YourTradebase. These changes are designed to improve the way you organise and manage your jobs, as well as a few smaller general improvements. Had a quote accepted by your customer? You can now convert quotes to a job in a couple of clicks, schedule a start and end date and start invoicing against it. Mark a quote as accepted and click ‘convert to job’ to get the job started. Any materials, labour and pricing information will be available right from within your new job. Got a job about to start? Stay up to date with your notes, what work is required and what materials you need with the new job sheet feature. Job sheets display the latest information for a specific job and can be downloaded, printed or emailed like any other paperwork in YourTradebase. All your jobs’ works items – including a breakdown of materials and labour – are available to view along with job details and notes. 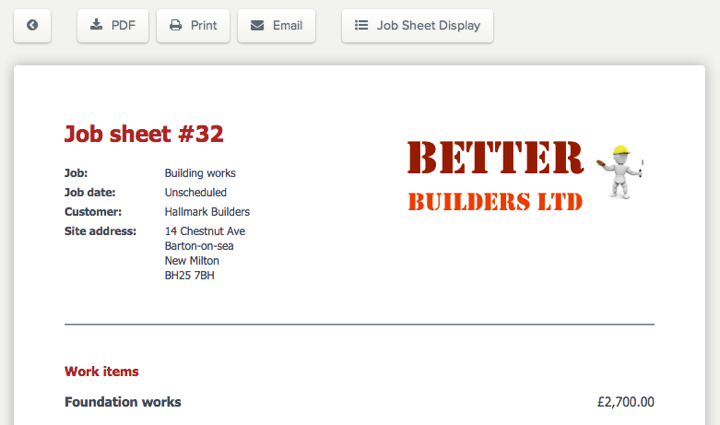 Easily customise the options you want to display, then print a copy to take on the road or email to your teams on site. Visit your job, click the new ‘work details’ tab and select ‘View job sheet’ to see job sheets in action. We recently introduced a new calendar function to help you see your upcoming work, and we’ve now improved job scheduling further with the ability to select start and end times for your jobs. Jobs start times can be scheduled in just a few clicks, and you can browse your work calendar to see available work slots right there and then. Creating great looking, professional paperwork is at the core of what YourTradebase does, and we’ve worked to make customising your paperwork even easier. Select ‘Display options’ on any quote, invoice or job sheet and you’ll see a better way to select how your paperwork is displayed. With more options and easier navigation you get more control over the look and feel of your paperwork. What percentage of your quotes are you winning? How many invoices are outstanding? How many leads are you converting to won? We’ve updated your quotes, leads and invoices pages to make it easy to answer these questions and see how you’re performing. As always, all of these updates are available the next time you sign into YourTradebase. Wishing you a successful – and happy – 2015! It’s important to deliver professional quotes with clear pricing to your customers, but sometimes your customer have choices. You might offer optional extras, or different levels of service. 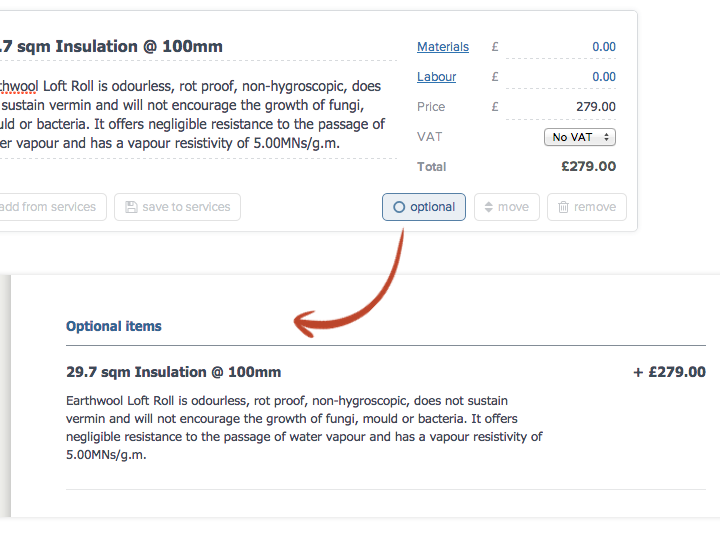 Well, now you can add optional price items to your quotes and estimates for your customers to select. Available now: start adding optional extras and optional prices to your quotes in YourTradebase today. Your work diary is a vital tool for your business, so we’re very pleased to announce a new calendar for YourTradebase, so you can more easily view and schedule all your jobs and tasks. You now have your own digital diary to manage your workload and schedule your todos. From your calendar, you can drag and drop jobs and tasks to schedule them or change their start or due dates, drag jobs to alter their duration across multiple days or weeks and quickly view the details of your jobs and tasks. You can quickly browse your calendar and job schedule by month, by week or by day, as well as navigating through months to see your upcoming work and gaps in your work schedule. Subscribe to your calendar in Google Calendar, Apple Calendar or Outlook and get your updates wherever you are. 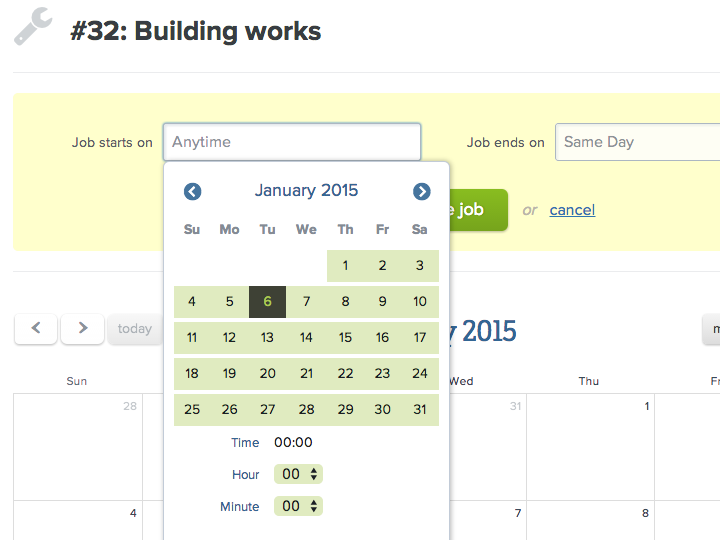 Changes you make to jobs and tasks in YourTradebase will automatically be updated in your calendar software. Learn more about how to use your new calendar or how to subscribe to your calendar. You can now upload all types of files to your jobs, customers, quotes and invoices in YourTradebase. We’ve introduced file attachments to YourTradebase. You can now upload files to customers, jobs, quotes and invoices for your reference. You can upload any files of up to 10mb in size. Find out more about uploading files from our help guides. 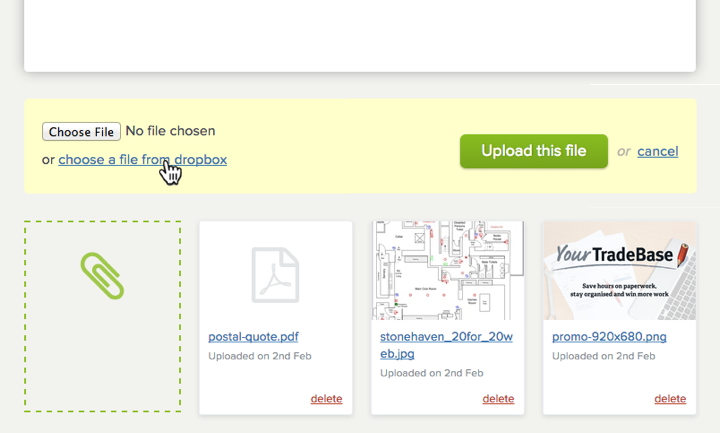 You can also use the new file uploads to attach files when you send your quotes or invoices to your customers. It’s easy to attach files to your emails: find out how to attach files to emails. You now have more control over what reminders you receive from YourTradebase and when you receive them. Your Email reminders settings have now been upgraded. Visit your Settings > Email reminders page to update reminders and suit the way you want to work. 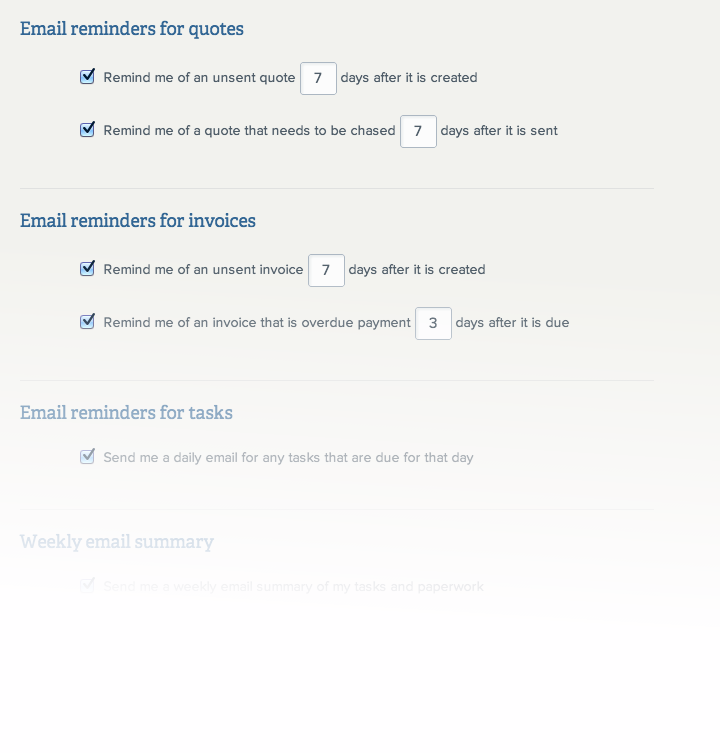 Click here to find out more about setting email reminders. A lot of sub-contractors need to show a CIS deduction on the invoices they present for payment, so it’s no surprise that CIS calculation is a frequently requested feature in YourTradebase. We’re pleased to announce that sub-contractors are now able to calculate CIS deductions within their invoices. CIS deductions will then be displayed on invoices ready to email, download or print. Find out how to deduct CIS from your invoices in YourTradebase. Labour rates are available within your quote and invoice items for you to start using. Learn more about saving labour to your labour rates list. If you’re adding and pricing materials to your quotes, you can now view all the required materials for each quote in one easy list. Re-use your saved services more quickly and easily, and save time typing! Learn more about setting and saving your services in YourTradebase. Emailing paperwork to your customers just got a little bit smarter; we’ve updated customer email address selection when sending paperwork. You can now select addresses for your customer from a drop-down selection and email the same paperwork to multiple addresses. If you enter a new email address, that will be automatically saved for that customer to re-use later. 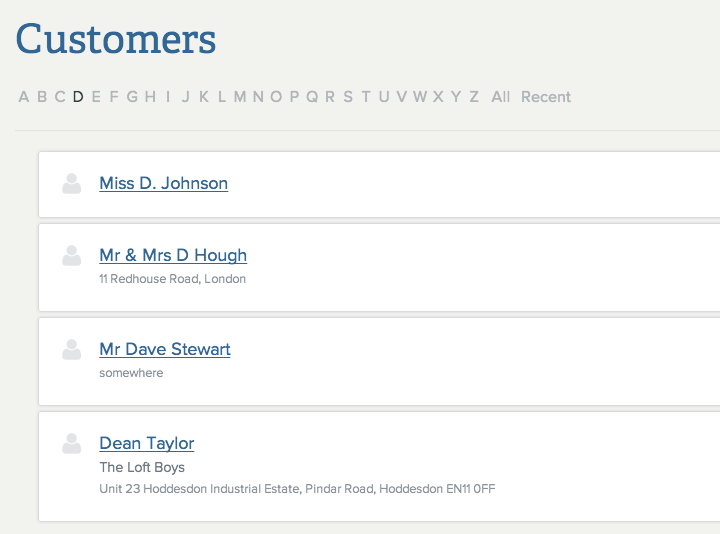 We’ve also upgraded customer filters in your customers section.